The guys from Car and Driver are hosting their usual Lightning Lap contest this year as well and this time BMW is represented by the new M5 and all of the goodies on board. The guys just posted the lap on Youtube, as usual, done on the Virginia International Raceway. The uber-sedan was included in the LL3 class, for cars priced between $65,000 to $124,999 and it managed to finish faster than anything else thrown in the mix, in this segment. The new M5 comes with a heavily revised version of the already familiar S63 4.4-liter twin-turbo V8. This time, it develops 600 HP and 750 Nm (553 lb-ft) of torque and it delivers all of that to all four corners of the car via an 8-speed automatic transmission. Therefore, the 7-speed DCT unit was retired but the 8-speed ZF gearbox does a great job nonetheless. Furthermore, the new M xDrive makes sure you get just as much grip as you want in any given situation. That’s because the system allows you to choose where the power is sent and how. Picking between 4WD, 4WD Sport and 2WD modes will offer you the possibility to just do whatever you want on the track, if you feel like you’re faster in a certain combination. Unfortunately, we don’t know exactly what driving mode was used in the footage below and what the driver preferred to get the most out of the car. What we do know is the lap time. 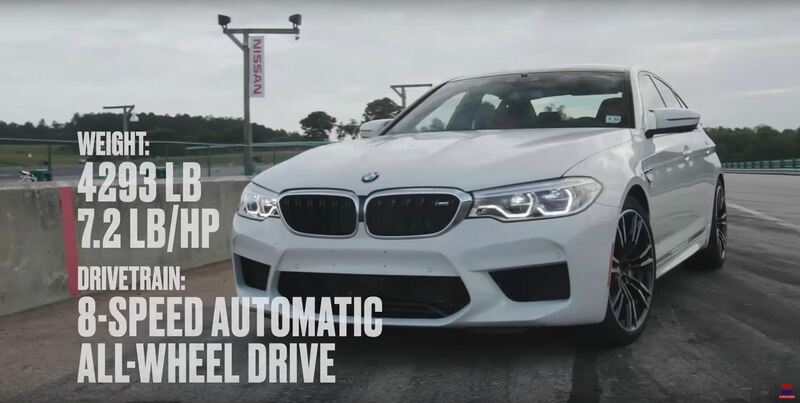 Apparently the F90 M5 went around Virginia International Raceway in 2:55.2 which makes it the fastest 2018 LL3 car in the Lightning Lap competition, faster by just 0.2 seconds than the 2018 Mercedes-AMG E63 S and 1.5 seconds ahead of the 2018 Porsche 718 Cayman GTS. Compared to the 2013 M5, the F90 model is now 10 seconds faster on VIR which is a pretty massive improvement between generations.